Indonesia is an archipelagic country. The number of islands owned by Indonesia reaches tens of thousands. No wonder Indonesia has the great beach tourism potential. The beach is a geographical form consisting of sand, and is found in the coastal areas of the sea. The coastal area becomes the boundary between land and sea waters. One of the island that has much beach is Bali. Here, we would give some directions how would you go to the beach from Ubud. Ubud is actually not located near the beach. However, here is the list of beaches in Bali near Ubud. 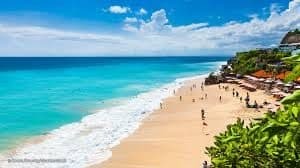 I am sure you must have been vacationing at Kuta beach Bali, one of the most popular and famous white sand beaches in Bali to foreign countries. 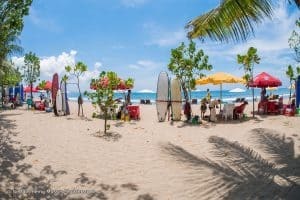 The attractiveness of Kuta beach Bali that makes tourists really love the holiday to Kuta beach. Access to Kuta beach is very close to Ngurah Rai airport. The white sand there is very gentle and very wide. Supporting tourism facilities and infrastructures are widely available, such as hotels, restaurants, resorts and malls. You can also enjoy the beautiful sunset view in Kuta. If from Ubud, you will take an hour to get to this beach. Pandawa Beach is currently popular among domestic tourists. Most of the domestic tourists who vacation to the southern resort of Bali, always include a route to visit the beach Pandawa. You can see a rock cliff with a statue of five Pandavas. The white sand on this beach is smooth and clean. In addition, the sea water there is also calm and colored bluish. It is suitable for swimming and canoeing activities. If from Ubud, you need to travel for approximately 1.5 hours. If most of the white sand beaches in south Bali have the beauty of sunset scenery, in contrast to Sanur beach which has the beauty of sunrise / sunrise. The location of the coastline of Sanur located on the eastern coast of the island of Bali to make the sunrise on the beach of Sanur is very beautiful. Not only the sunrise view, Sanur beach also has a very clean white sand and is suitable for swimming activities. You only need to travel for approximately 48 minutes from Ubud. For those who feel the Pandawa beach is too crowded to visit and want a beach scene like Pandawa beach but do not want many visitors, then you have to choose Karma Kandara beach. Karma Beach Kandara neighboring Pandawa beach, both are in the tourist area Ungasan Bali, therefore the beach has almost the same karater. The difference is Karma Kandara beach for entrance access must pay a ticket of Rp 250,000 / person, this makes Karma Kandara beach very quiet and visitor privacy awake. You need to travel during 1,5 hours to reach this place from Ubud. 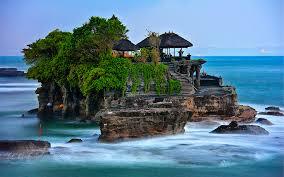 Tanah Lot Beach has almost the same popularity with Kuta beach Bali. Every day is crowded with tourist visits both domestic and foreign. Because of the famous beach of Tanah Lot Bali among domestic tourists, make most of Bali service providers tour packages, always include a tourist route in a tour package in Bali with menggunjungi beach Tanah Lot. The beauty of the beach of Tanah Lot Bali lies in the sunset with the silhouette of the temple in the middle of the sea. If you want to visit this beach from Ubud, you need travel time about 1 hour. The beauty of Dreamland beach is almost similar to Kuta beach Bali, with the beauty of clean white sand and ramps and supporting facilities such as restaurants and villas are also there are many around the beach Dreamland Bali. In contrast to the beach of Kuta Bali, on the beach of Dreamland there is a white rock that surrounds the beach, this creates the beauty of its own scenery. On the beach of Dreamland, you can also see the sunset view. It takes you 1.5 hours from Ubud to get to this beach. The white sand beach of Jimbaran Bali is favored by domestic tourists as it offers a unique activity ie, dinner with grilled seafood dishes on the edge of Jimbaran beach, while watching the sunset view. Jimbaran Beach is more suitable for tourists who are honeymooners who want a romantic dinner on the beach. While at night, there are a lot of romantic sea food restaurants with the colourful lamp. You have to travel for about an hour from Ubud to reach this beach. Nusa Dua Beach is a favorite for domestic tourists to visit because this beach is one of the cleanest beaches on the island of Bali. 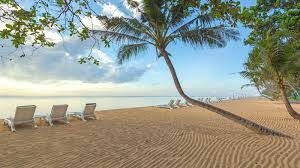 The cause of Nusa Dua beach is very clean, because along Nusa Dua beach there are five star hotels and there are always cleaners cleaning the beach. 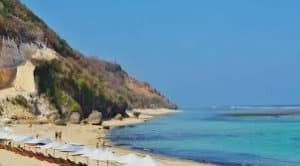 At Nusa Dua Beach there are 2 beaches, namely Geger beach and Mengiat beach, these two beaches are more suitable for swimming and safe for children to play, because the waves are small, very suitable for beach tourism with family. If you are from Ubud, you need to take about 1 hour. Karangasem virgin beach among local people are known by the name of the beach Perasi Karangasem. Referred to as the virgin beach of Karangasem, because of the virgin beach location is hidden and located in Karangasem district, one of the most eastern regencies of Bali. 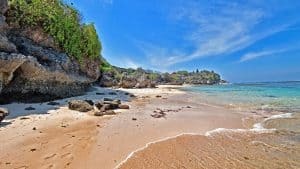 For now the location of virgin beach Karangasem not many people know, therefore the beach Perasi Karangasem included in the hidden beach category on the island of Bali. You need to take a 1.5 hour dive trip from Ubud. This beach is the closest beach to Ubud. It only takes you 28 minutes to get there from Ubud. 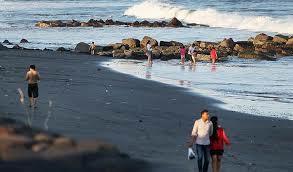 The black sand will immediately welcome the arrival of tourists who visit. Its location adjacent to the island of Lombok and Nusa Penida make you can “reach” both beautiful islands simply by visiting Pulau Pulau. Naturalness and beauty of the beach can anesthetize tourists who visit. The atmosphere is safe, peaceful, and calm makes this beach worthy of a vacation location for you and your family. Those are some of places in Bali near Ubud. All of th beaches has popularly beautiful scenery. You should go there while visiting Bali.